A question frequently asked by our customers in relation to our AWS IoT Analytics offering, is how to achieve a real-time dashboard of data flowing through IoT Analytics. 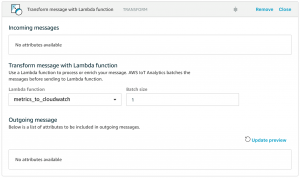 In this blog, I’ll show you one pattern for achieving real-time metrics by utilizing Amazon CloudWatch and the AWS Lambda activity of a pipeline. I’ve simulated 25 smart pump devices that send messages continuously as I use them with IoT Device Simulator, a solution that that enables you to create and simulate hundreds of virtual connected devices, without having to configure and manage physical devices or develop time-consuming scripts. These smart pumps report the temperature, humidity, pressure, and vibration data. Messages from these devices flow into my Amazon S3 bucket. I’d like to visualize the data flowing through these smart pumps in real-time to find any anomalous or alarming patterns so that I can proactively repair these devices. 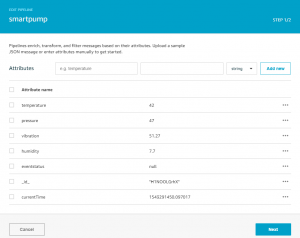 IoT Analytics helps me build a dashboard and analytical workflow that I can set up in minutes to visualize the data from my smart pumps. I use the BatchPutMessage API of IoT Analytics to send these stored messages to a channel. Messages flow from the channel into the pipeline, where they are processed. After processing, the pipeline sends messages to the data store. The pipeline is the key to getting my near real-time metrics. First I look at the attributes sent by my devices in the pipeline as it infers the message attributes from my channel. Now the first step is to create a Lambda function that routes data to Amazon CloudWatch, where we will build our dashboard. In this example, I’ve named the Lambda function metrics_to_cloudwatch. Once the Lambda function is created, it can be added to our pipeline as an activity. Let’s take a closer look at how this Lambda function works. As it pertains to the pipeline, this Lambda simply returns the messages it receives so they can continue to be processed. #  has attributes for pressure, humidity, vibration or temperature. #  function to emit the custom metric to Amazon CloudWatch. Hopefully the code is self-explanatory, but in essence what happens is that the Lambda function in a pipeline is passed an array of messages, with the size of the array dependent on the batch size that you configure for the activity. The default of 1 means that the Lambda function will be invoked for each individual message, which is fine for scenarios where messages only arrive in the channel every few seconds. When you have a high frequency of incoming messages (every millisecond for example) or when BatchPutMessage API puts multiple messages into the channel at a time, you might want to set the batch size greater than 1 to consolidate Lambda execution. An important permission step is that you need to make sure you have granted the Lambda function permission to access Amazon CloudWatch. If you forget this, and you have configured your logging options (see the Setting up CloudWatch Logs documentation), you’ll see error messages like this for your Amazon CloudWatch log stream “aws/iotanalytics/pipelines”. In conclusion, we’ve seen how we can leverage the Lambda activity that is available in the AWS IoT Analytics pipeline to route the message attributes we want to a near real-time dashboard in AWS CloudWatch, and trigger alarms when needed.